Daphne du Maurier sure knew how to write a short story. Having read her books and many of her short stories, I've always found that her talent shone best in her short fiction. She could say so much in just a couple of pages. The Doll, The Lost Short Stories of Daphne du Maurier is a collection of her early work written when she was in her twenties. Most of the stories had been published in magazines and then forgotten about. Her writing career was just beginning; bigger things were to come. The Doll, the title story of the collection, I reviewed earlier this year and a few other stories were published in The Rebecca Notebook which I read last year. A few of the stories I had never read before. There is not a particular theme to the book. The stories run from noir, to funny, to introspective. Many are about the disappointment of romantic relationships. From those stories, you would think that du Maurier didn't believe men and women could be happy together. All relationships end in bitterness. Not much of a romantic at that age. There was one I found quite funny because I could relate to it. In Week-End, a couple in love take a holiday which ends in disaster. I once had a similar situation on a trip with my husband when we were first dating. Unlike the couple in the story, we got over it and can laugh about it. Maybe if the couple had a sense of humour about it they might be where my husband and I are now. Frustration is also a funny one. The frustration is over a couple's difficulties in having a wedding night. *wink, wink* The irony is a little over the top but so hilarious. You can't help but sympathize with them while laughing at their predicament. In The Happy Valley, the protagonist dreams of a house in a valley. Dreaming of a house? Hmm. Where have I heard that before? This story is closest to the types of stories she would later write. There is an element of the supernatural as the protagonist is seeing a vision of her future. With the variety in this collection, there is sure to be a story or two for you. 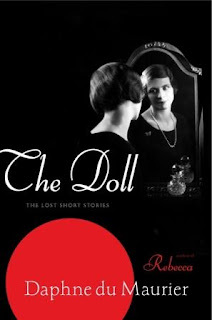 The Doll, The Lost Short Stories is an interesting look at a master storyteller at the beginning of her career. Recommended. Thanks to TLC Book Tours for the review copy. For more opinions, see the tour schedule. Reviews seem mixed on this one, but I would like to try it. Thanks for sharing. I have this one on my shelf to read, but haven't gotten to it yet. Thanks for sharing. I really enjoy short stories. Frustration sounds great. Would love to read it. I've been enjoying short stories more and more lately. However, when I think of Du Maurier I always think of myself completely immersed into the writing. I can't do that really with a short story. I can appreciate them for what they are, but that total immersion factor is not there. I still haven't even read Rebecca! I loved Rebecca so much I'm afraid to branch out and read any of her other works. If that makes any sense. Diane- I hope you do. Julie- Great, hope you get to it. Lena- I love her short fiction and I'm not a short story fan. Ti- That's true although her short stories fascinate me. Joanna- You must read Rebecca! Jill- I know what you mean. I've read a lot of her books and they aren't all winners. I wish I could have read past the first two to get to one I thought introspective or even romantic. I was sorely disappointed in these stories because I enjoyed Rebecca and Don't Look Now so much. I have heard mixed opinions on this collection, so have been hesitant to read it until after I have explored her other books a bit more. I am glad there are some good stories in the collection, though! I like that there is such variety in the stories in this collection - seems like there would be one for any mood I found myself in (except maybe a romantic mood!). I really need to reread REBECCA! I haven't read it since high school. And then this sounds nice. I really need to read more short stories.